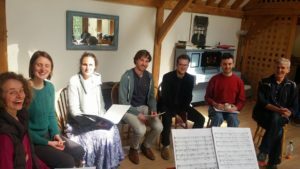 Thanks to Clemmie Franks, Victoria VC, Emily Burn of Voice, Rory Green, Alistair Walker, Humphrey Thompson and Chris Franks for a great recording session at Bartlemas Farmhouse Barn. We recorded 2 of my pieces, Bhur Bhuvah Svaha from The Conscious Sky and Musical Harmony, and SATB working of a piece previously written for Voice. The recording was engineered by Adaq Khan.